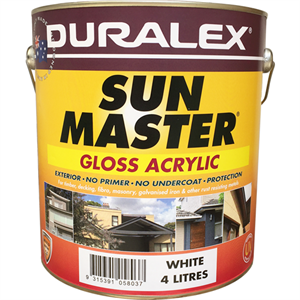 Duralex SUN MASTER GLOSS is a tough 100% Acrylic house paint specially formulated to protect against the harsh Australian climate. As well as containing Zinc Oxide and other U.V. blockouts, it is better able to expand with heat and contract when cold, than ordinary paints. Weatherboard, pergolas, picket fences, rails, plasterboard, particleboard, MDF, galvanised iron and other rust resisting metals, fibro and masonry. 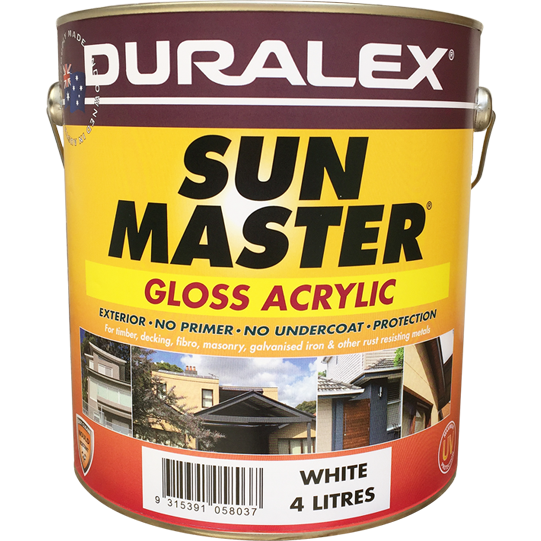 It is not recommended for contact surfaces such as windows, doors or trims, furniture, shelves or wrought iron. These are best painted with turps-thinned enamel.